"Cosmic ray observations above 50 kilometers altitude," Van Allen stated in the original proposal, "have a special simplicity and importance because only above such altitudes can one's apparatus be placed in direct contact with the primary radiation before its profound moderation in the earth's atmosphere." Over the preceding nine years he and his associates had pursued investigations by means of sounding rockets, but an instrumented earth satellite could provide in a week more satisfactory data than scientists could obtain from rockets in twelve years of work. A worldwide survey from a satellite would furnish information on the geographical distribution of arriving cosmic radiation and permit deductions about the magnitude and nature of what is solar in origin. If the satellite orbit were pole to pole, or even equatorial, the survey would produce a mapping of the earth's effective geomagnetic field and reveal the correlation of fluctuations in cosmic ray intensity with terrestrial magnetic and solar activity. Cereokov detectors, already successfully used in Skyhook balloon flights, could measure the relative abundance of the light elements of cosmic radiation-hydrogen, helium, lithium, beryllium, boron, carbon, nitrogen, oxygen and fluorine and thus establish the distribution of nuclear species in the primary radiation before it encounters the atmosphere. Simple measurements would also increase knowledge of the nature of the cosmic ray albedo of the atmosphere. (Albedo is the ratio of the amount of electromagnetic radiation reflected by a body to the amount incident upon it.) As the albedo consists of products of nuclear reactions, in the upper levels of the atmosphere. which happen to proceed in upward directions, measurement of the total cosmic ray intensity as a function of distance from the earth should permit determination of the magnitude of the albedo. A simple detector in the satellite should, moreover, furnish means of charting the arrival of auroral radiations at the top of the earth's atmosphere. "Temperatures between 5° and 50°C will be acceptable to all of the items operating in the satellite." Transistor characteristics were the principal limiting factor. "More advanced transistors probably will be able to operate successfully in the range from -20° to +80°C. It is expected that this temperature range can be maintained within the central sphere provided the surface sphere is coated with an appropriate material such as ALSAC. This material is highly reflective to solar radiation, yet highly emissive with respect to infra-red radiation." Every scientist preparing an experiment would have to take these conditions into account. Transistorized circuitry, desirable because of its light weight, had the disadvantage of sensitivity to extremes of temperature. Similarly the capacity of the satellite's outer shell to resist puncture by meteoric and micrometeoric particles and to withstand the action of atmospheric ions would affect the level of pressures on the inner sphere and might thus modify performance of the instruments housed in a central insular region. To accumulate exact data on surface and internal temperatures, surface erosion, and internal pressures. NRL proposed to conduct environmental studies in the first satellites launched. and/or be likely to lead to the discovery of new phenomena"; the second was that of technical feasibility as established by use of similar techniques in rockets or other scientific vehicles, by the "adaptability of the instrumentation to the physical conditions and data transmission potentialities of presently planned satellites," by "the nature of data to be expected," and by "feasibility of interpretation of observations into fundamental data"; the third was that of the competence of the persons or agencies making proposals, an assessment based on past achievements in work of the kind proposed; and the fourth was that of the necessity, or strong desirability, of using as the vehicle for the experiment a satellite rather than a sounding rocket or a balloon, The group, however, went on record as wanting to encourage proposals that would help develop a "reservoir" of scientific competence in devising experiments for future satellite flights "even though such work may not yield practical apparatus for the short-range ICY program.13 Is The WGII, in short, saw its task as extending to plans for space exploration long after the ICY ended. After abbraising the WGII's report, the panel voted to limit for the time being "the positive standing on the Priority Listing" to nine projects, thereby discarding three. The subsequent voluntary withdrawal of two others further reduced the number. By common agreement, Friedman's Lyman-alpha experiment, the environmental studies, and the proposal from the State University of Iowa headed the list from the beginning, even though sounding rocket experts at NRL had pointed out that a series of rocket probes could provide cosmic-ray observations as well as could an instrumented satellite.15 The plan of Van Allen and Ludwig by now called for apparatus that was to consist of two parts: instruments for continuous transmission of signals marking the instantaneous intensity of cosmic rays registered by the Geiger-counter, and, second, equipment to store the instantaneous intensity data during each orbit for read-out on command over the Minitrack stations. A small cylinder would house batteries, a receiver, a transmitter, tuning forks, a tape recorder driven by a ratchet system, scalers, and generators. The Geiger-Mueller tube would project about 4.5 inches from the top plate of the cylinder. Fourth on the priority list was an experiment entitled "Measurement of Interplanetary Matter," submitted by Maurice Dubin, E. R. Manring, and others of the Geophysics Research Directorate at the Air Force Cambridge Research Center. Their plan was to detect the spatial distribution and size of particles colliding with the satellite-even those as small as one micron in diameter-by recording the acoustical energy generated on impact. Instrumentation would consist of a sensitive piezoelectric transducer on the inside surface of the satellite shell, a transistorized amplifier, a storage device, a power package, and a time-delay switch set to operate after the Minitrack telemetry began to transmit. The memory device was to count the number of stored impacts, record the distribution of particles by size, and transmit the information when the amplifier was in use. Somewhat similar in purpose to Singer's rather simple meteoric dust erosion experiment, Dubin's appeared to have greater scientific utility; perhaps the two might be combined. The panel recommended that Dubin receive the grant of $89,045 that he requested, Singer, though his plan stood in category B, a grant of $47,150. Although the expense of developing internal instrumentation was beginning to run unexpectedly high, the panel assigned "back-up" status to several projects. So Hinteregger's scheme of measuring extreme ultraviolet solar radiation won official endorsement and, later flown in a rocket, produced some significant data. Singer got funds to complete his radioactive meteor erosion gauge, money which the panel switched in 1958 to support his endeavor to devise means of determining the electrostatic charge accumulated by a satellite, but he never submitted detailed designs or an experimental prototype. A grant went also to the group of men, headed by William Pickering, at the Jet Propulsion Laboratory for development of instrumentation to measure the integrated light from various parts of the celestial sphere, using a set of color filters and a photomultiplier detector. Planned for use in case more experiments could be flown during the IGY than anticipated, the JPL equipment was never put to the test in a satellite, but the work on it proved useful in preparing later projects. An experiment proposed by Martin Pomerantz of the Bartol Research Foundation and Gerhardt Groetzinger of the Research Institute of Advanced Studies was in turn given funds, even though the ion chamber and circuitry designed to identify the heavy primary cosmic ray nucleii and the possible variations in their flux appeared unlikely to be available for IGY satellites. Interestingly enough, no experiment in the life sciences received endorsement. Yet in 1951 and 1952 Kaplan had viewed the possibilities of medical research in the aeropause as an impelling reason for a satellite program and the NRL proposal to the Stewart Committee had alluded to the feasibility and utility of studying the behavior of living cells in the vacuum of space. Early in 1957, a biologist at the National Institutes of Health submitted a plan for recording the effects on yeast cells placed in an orbiting satellite, but the panel postponed action on the idea. Work on the satellite structures and instrumentation meanwhile had moved along rapidly at NRL. Since every experimenter was to furnish his own apparatus, the naive reader might assume that the team at the Laboratory would have relatively little to do: merely supply the satellite shell, the telemetry, the antennas, and the tracking transmitter, and then install the package of experiments. But those tasks in themselves were formidable. The satellite as planned had to carry a device for separating the sphere from the rocket casing after third-stage burnout; the shell and every mechanism in it must be sturdy and lightweight; and to fit all the items into a twenty-inch sphere required miniaturization of an order never before thought attainable. The layout of instrumentation, furthermore, had to vary from one satellite to the next so as to adapt each to the particular experiments it was to accommodate. Nor did the job end there, Thermal control presented enormous difficulties, and the entire testing program demanded scientific knowledge, great ingenuity, and endless patience. Whitney Matthews, who was in charge of the electronic layout within the spheres, demonstrated the general scheme of stacking the layer of "cards" of miniature mechanisms and locating their power supply. As was true of other features of the satellites, each package would differ somewhat in both content and arrangement from every other. Although little of the work was in final form in April 1957, the economy of the intricate layouts, the complexity of the tiny parts, and the delicacy of the workmanship were already plainly visible. Roger Easton then explained in detail how the tracking and telemetry equipment would function. The tracking signals would be amplitude modulated for telemetering the scientific data obtained from the satellite-borne detectors, A transistorized transmitter in the satellite weighed 1.25 pounds, including the weight of Minitrack batteries for two weeks' operation, and used about 7.5 pounds of mercury cell batteries that would give three weeks of continuous operation at fifty milliwatts output for telemetry. Telemetering might be continuous or could function on command. When commanded, a receiver weighing twelve ounces including its power supply would pick up the signals sent from the ground. While the command receiver in every satellite would be standard, the telemetry transmitter might differ in type, depending on the requirements of the experiments carried. On the ground the telemetry receiver was to be located at some distance from the tracking receiver. NRL had built the first tracking transmitters in its shop; testing and evaluation of performance had been going on at the Blossom Point station since July 1956. Of equal or perhaps even greater interest to the visiting scientists attending the conference were the accounts of the methods under development to provide thermal protection for the satellite shell and its payload. Solving these problems, above all those deriving from the effects of radiation under various conditions, called for pooling the talents and experience of several men, notably Hermann LaGow, who had planned the environmental studies accepted for the first satellite flight, Richard Tousey and Louis Drummeter of the NRL Optics Division, Milton Schach of the Electronics Division, and George Hass of the Engineer Research and Development Laboratories at Fort Belvoir. 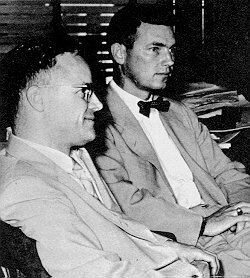 Newell and Townsend, who had initially objected to launching a 6.4- inch satellite with no internal instrumentation, were reconciled to the plan as thermal testing proceeded, for the agreement to place temperature sensors on the 6.4-inch shell promised to verify the findings of the Laboratory tests or else supply data that would permit development of better thermal control for the larger instrumented satellites. Although the research and testing was still going on when the conference with IGY experimenters took place in the spring of 1957, the NRL thermal experts were already fairly confident that they could limit temperature changes within the instrument container to some two or three degrees during any one orbit. While expectations ran that a Vanguard satellite would have only a few weeks' life, the possibility of its lasting longer led to endeavors to adapt thermal controls to seasonal as well as diurnal changes. and Homer Newell participate in a conference in the director's office. When the impending start of the IGY brought a number of internationally known scientists to the National Academy in June 1957, the presence of several eminent Russian astronomers and geophysicists added greatly to the interest of the occasion. Contrary to later popular hearsay in the United States, the Soviets talked of their plans, and I. P. Bardin turned over to Lloyd Berkner a document entitled "U.S.S.R. Rocket and Earth-Satellite Program for the IGY." In the section of the exhibit hall given over to the satellite program, reporters clustered around John Hagen and his Russian counterpart. Hagen in answering questions repeatedly spoke of the NRL satellite, whereupon a very junior member of the IGY staff corrected him with "The National Academy's satellite. Dr. Hagen. "33 The incident revealed the constant stress the Academy felt obliged to put on the nonmilitary character of the program. July publication of the first issue of the IGY Bulletin served again to remind readers that the National Academy was responsible for the undertaking. The summer of 1957 was not a time of rejoicing for the men handling satellite finances. The expenses of the Glenn L. Martin Company and subcontractors had increased steadily since October 1956, as indeed had the costs of the scientific parts of the program. Despite the transfer of $5.5 million of National Science Foundation funds to NRL in October 1956 and another $1.862 million in March 1957, the Vanguard comptroller estimated in April that the bill for the entire satellite program would run to $110 million, NRL's costs alone to $96.162 million.34 The Navy budget was not the direct concern of the IGY satellite panel, but it would become so if financial exigencies caused serious slippages in the Vanguard launching schedules, As every setback to the program dimmed the chances of the Academy's winning endorsement of its cherished plans for twelve shots, the USNC secretariat awaited with anxiety the results of the Navy's appeal to Congress. His figures were all-inclusive, a fact rarely understood, then or later, by people not intimately involved with Vanguard. From the cost of the new radar, the blockhouse, and telemetry equipment-all destined to serve Cape Canaveral for years-to the pay of NRL shop hands for part-time work on Vanguard hardware, every iota of expense was taken into account, even items that a less meticulous person might think properly chargeable to Laboratory or Navy overhead. While Richard Porter and the IGY staff at the Academy were aware of the successive delays, when CSAGI gathered in Washington on 30 September for a week-long conference on rockets and satellites, most members of the TPESP knew relatively little about Vanguard tribulations. The panel had not met since l May. At that time news emanating from the Pentagon had been blandly reassuring. Now panel members learned that the flight test of a Vanguard test vehicle with two dummy stages and minus a satellite was set for mid-October. The panel meeting held on 3 October was thinly attended: Lyman Spitzer had resigned; Odishaw, Spilhaus, and Newell were engaged with the CSAGI sessions; Van Allen was en route to the South Pacific. Chairman Porter was worried, but if the other men present shared his unspoken belief that a Russian satellite was nearly ready for launching, they kept their foreboding to themselves. Most of the discussion focused on optical tracking and how to speed up deliveries of the Baker-Nunn cameras, Whipple, to be sure, raised the question of whether the Academy was satisfied with the Vanguard flight schedules, but Porter pointed out that launchings were solely a DoD responsibility. The panel adjourned without pursuing the subject.40 Twenty-four hours later everyone even remotely interested in the American program was asking when the United States would put its first satellite into orbit.